As I love Fabergé's Egg miniatures, and I hated myself that I did not discover the errors, especially as I already found quite some other misidentified miniatures , I set out to find the building depicted on "view 9" and I would not rest until I had it! And here it is! 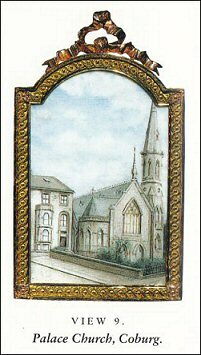 The house and the church on the miniature "view 9" are in the United Kingdom, in Harrogate. It is an interesting story why this rather modest house was chosen by Fabergé for one of the miniatures, so I will tell you! For me this journey to Harrogate started finding the above photo of the Empress. The inscription reads "Alix Princess of Hesse Harrogate 1894". 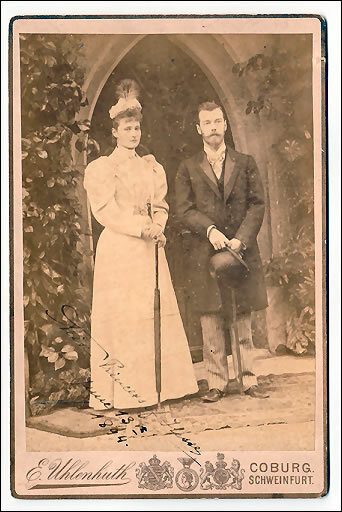 This is a very familiar photo for it was made in Coburg Germany, on the April day in 1894 that Princess Alix and the Tsarevich Nicholas became engaged. The dedication on the photo is in the Princess' handwriting, so she apparently traveled to Harrogate later in the same year where she presented the photo, and it is here in Harrogate where the miniature comes in. 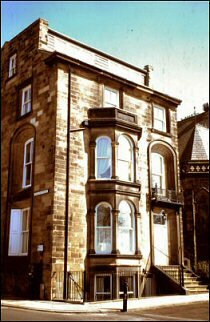 It was in Cathcart House, a boarding house on Prospect Place, West Park, the house on the left on the miniature and the photo below, that the Princess Alix and her lady-in-waiting, Gretchen von Fabrice, came to stay under the name of Baroness Starckenburg  when she traveled in May 1894 to Harrogate to take the famous baths and to undergo a treatment for her sciatica . 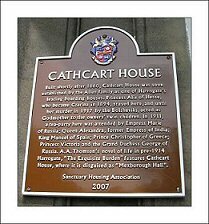 Built shortly after 1860, Cathcart House was soon established by the Allen Family as one of Harrogate's leading boarding houses. Princess Alix of Hesse, who became Czarina in 1894, stayed here, and until her murder in 1917 by the Bolsheviks, acted as Godmother to the owners' twin children. In 1911 a tea-party here was attended by Empress Marie of Russia; Queen Alexandra, former Empress of India; King Manuel of Spain; Prince Christopher of Greece; Princess Victoria and the Grand Duchess George of Russia. 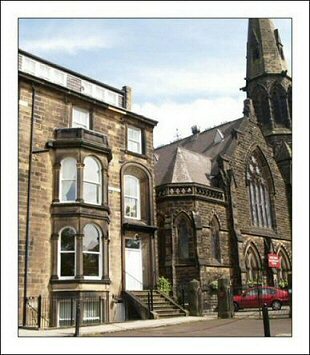 A.A. Thomson's novel of life in pre-1914 Harrogate, "The Exquisite Burden" features Cathcart House, where it is disguised as "Mexborough Hall". The house was run by the Allen family and Mrs Allen had just given birth to twins, a girl and a boy. To Alix this was a good omen for her future wedding to the Tsarevich, so she asked to be godmother of the twins and that the girl be called Alix, after her, and the boy Nicholas, after the Tsarevich. The Princess attended the christening of the twins and signed the Baptismal certificates. The christening presents included a pair of gold sleeve links, to bear the Princess's crest, for the boy, and a small gold enamelled heart-shaped necklet, with pearl in centre, for the girl, from Her Grand Ducal Highness. The Baroness Fabrice gave a fine gold chain to wear with the necklet. The Mayor gave a silver rattle to each of the babies, whilst Mr. John Robinson presented a silver jug and spoon. Mr. and Mrs. Allen (grandfather and grandmother) presented each child with a silver napkin ring. Most of these presents were supplied by Miss Anderson, the Arcade. Mr. Baxter, of Northallerton presented the boy with a gold watch . The bond between the Allen family and the Princess, later Russian Tsarina Alexandra Feodorovna was strong as in 1910 a pair of Fabergé gold cufflinks were given to Nicholas Allen as a confirmation present from his godmother, the Tsarina of Russia. A History of the World article: Fabergé cufflinks - a Czarina's gift. The cufflinks as well as the christening presents are now on display in the Pump Room Museum in Harrogate. While trying to find a contact in Harrogate to discuss this story, I was very lucky to come into contact with Mr. Malcolm Neesam. Mr. Neesam is Harrogate's historian and it so happens he is particularly interested in the Russian connection to the town. It is he who wrote the text on the above plaque and other plaques in Harrogate. Mr. Neesam was so kind to send me some recent photos and I am thankful to him for giving me permission to show them on this page. 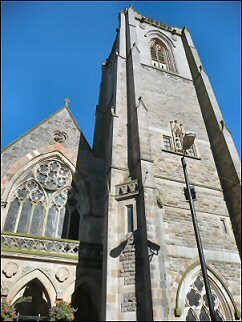 Left to Right: 2016 Cathcart House, Cathcart House and United Reformed Methodist Church, and St. Peter's Church. Photos Courtesy Malcolm Neesam. 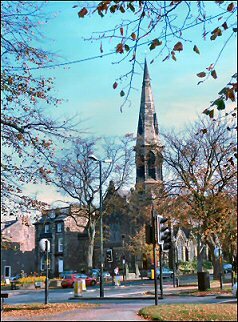 Harrogate also has very strong links with the Tsar’s Cousin, Her Imperial Highness Marie Georgievna Romanova, Grand Duchess George of Russia, who first visited Harrogate in 1910 on the recommendation of the Tsarina, who as Princess Alix had stayed at Cathcart House. Marooned in Harrogate on 4th August 1914, the Grand Duchess opened several military hospitals for wounded soldiers, which she ran until 1919 – a truly remarkable act of humanity. You can read the very moving story about the "Grand Duchess and her Tommies" in this 2014 article! And now for the one million dollar question; Why did it take so long to identify the miniatures correctly? 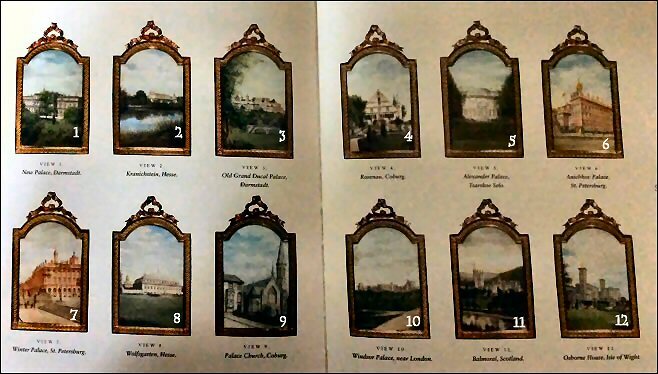 Apparently Queen Mary (1867 - 1953), wife of King George V of the United Kingdom, was at some point in time asked to identify by photo the buildings on the little miniatures. 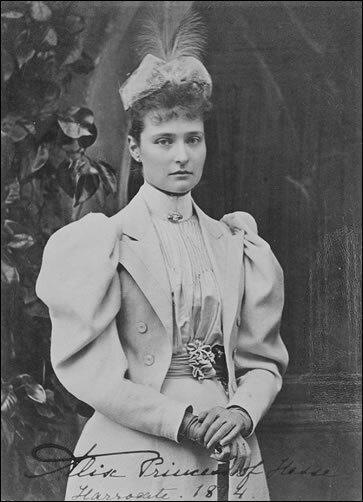 As her husband was a first cousin to both Tsar Nicholas II and Tsarina Alexandra Feodorovna, she was the expert par excellence! And who would dare to doubt a Queen?! 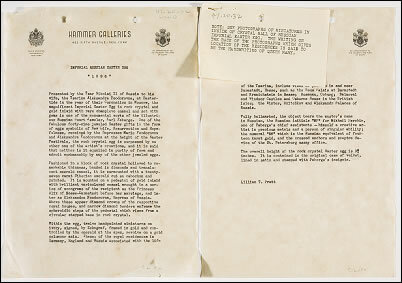 Postscript Hammer notes. 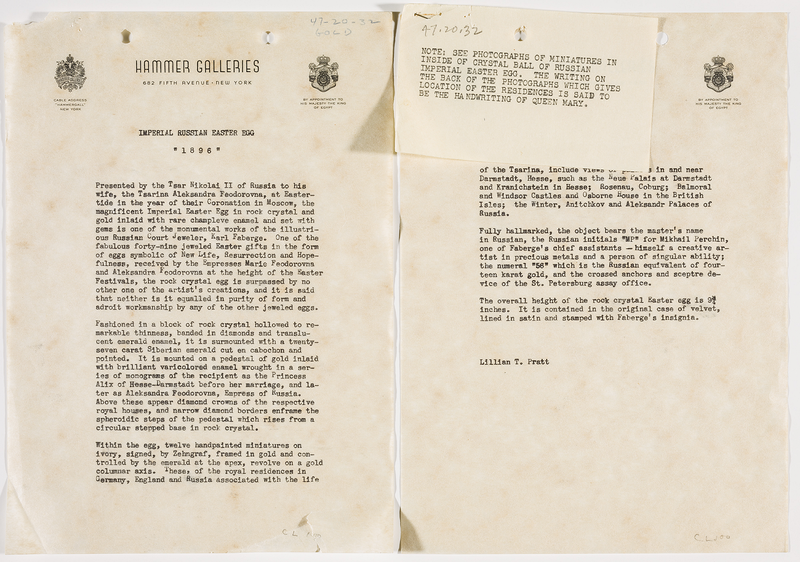 (April 2017) Of course we now dare doubt a Queen and the VMFA searched in their archives and found the photographs referred to in the little typewritten note above. Comparing the writing on the photographs with that of Queen Mary found online, the handwritings were thought similar but not the same! Update February 5, 2017. 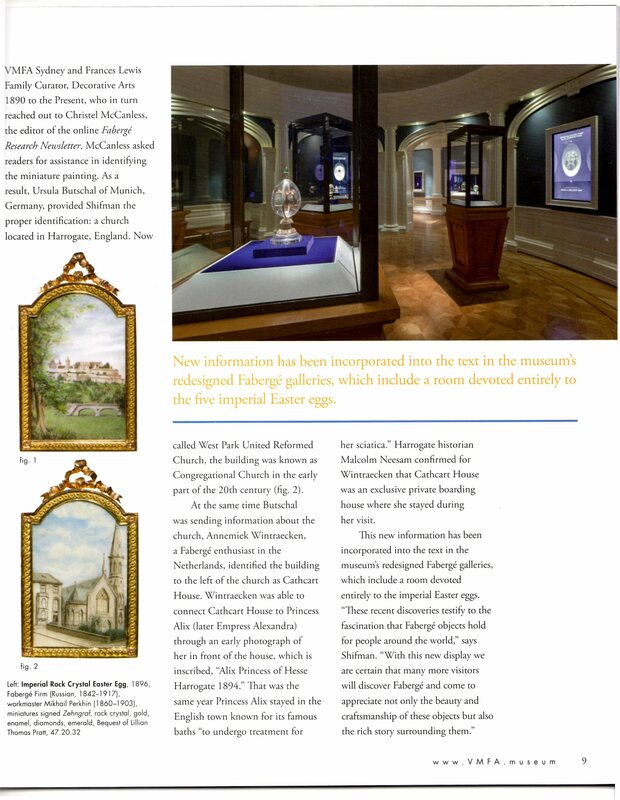 Correction VMFA article. This was obviously not the case as you can read above. There is no such photo! The photo in question is the photo of Princess Alix taken in Coburg on the day of her engagement to the Tsesarevich (see above). For those who want to read the whole article, click here for page 1 and here for page 2. Thanks to Elizabeth Jane Timms, I now know the original source of the Princess Alix photo posted above. Auction House Bonhams offered the photo below in their Russian Sales on June 1, 2006, as lot 163. 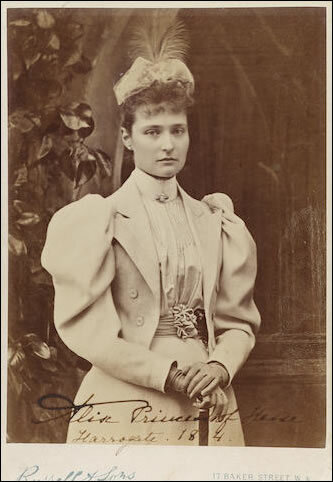 Staying under the name 'Baroness Starckenburg', at the time of the photograph Alix was visiting Cathcart House, a spa in Yorkshire where she received treatment for sciatica and enjoyed a degree of privacy following the flurry of public interest in her engagement to the Tsarevich Nicholas earlier that year. And is there such a thing as coincidence?! Just today, Thursday February 9, 2017, I see the Antique Trade Gazette announcing the auction of gifts from the Empress to her Yorkshire godchildren, Alix and Nicholas Allen! 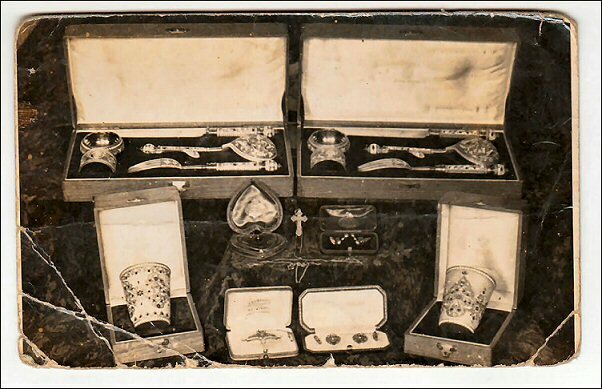 Below courtesy of Antique Trade Gazette, a photograph of the original whole set, including (lower row, second from right) the cufflinks shown above, now at the Royal Pump Room Museum, donated by the son of Nicholas, Michael Allen. More (colored) pictures of the gifts on the Antique Trade Gazette website! 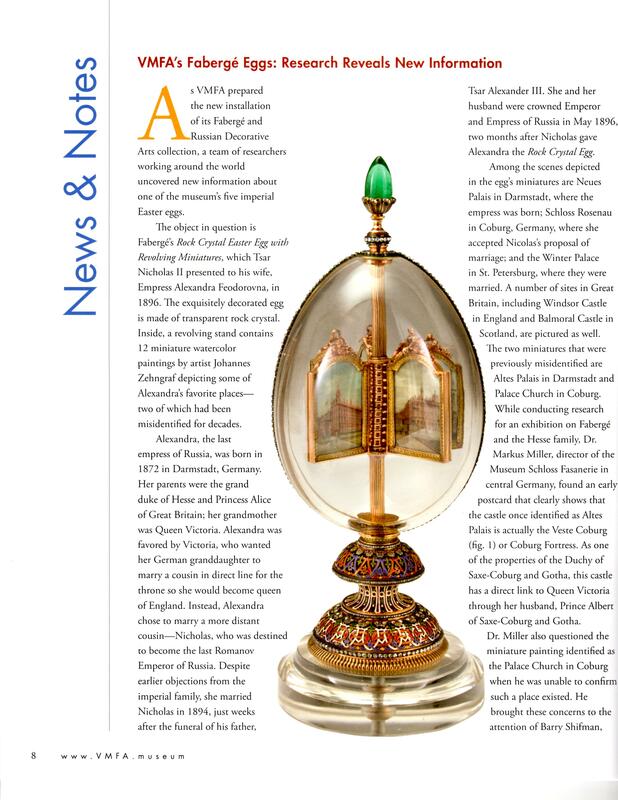 What a wonderful end to this special story about a miniature on a Fabergé Egg, made more than 120 years ago (1896) and only identified last year, and how the story now lives on in the Harrogate Pump Museum and wherever the coming auction will bring the Empress' gifts! Those of you interested in a description of the twelve miniatures and their historical significance to the young Empress, here you are - Personal Messages on the Zehngraf Miniatures: 1896 Egg with Revolving Miniatures - By DeeAnn Hoff, Independent Researcher - Courtesy Fabergé Research Newsletter. And how very nice, Joanna Wrangham found what must have been the original postcard, being the source for the miniature painting by Zehngraf. 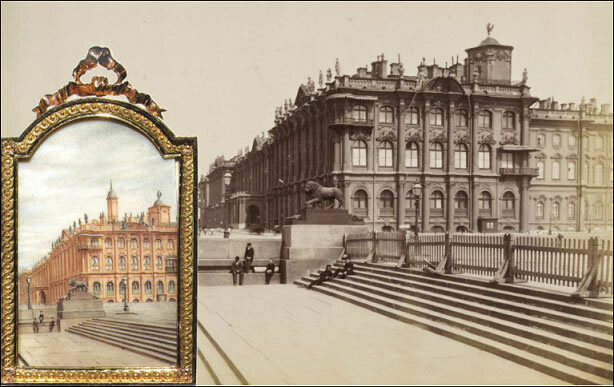 One can clearly see the three little persons on the card and the miniature in practically the same spot sitting on the bridge near the Winter Palace, colored red in those days. Johannes Zehngraf eliminated the fence shown on the card to the right, and added the ventilation tower on the roof, built in 1895. See for this story and enlargements of the images, Joanna Wrangham - Winter Palace Research Blog. September 5, 2016, updated October 2016, 2017, etc.